Do not fret, your next session of “R3HAB” is booked in. To provide aural enlightenment with a range of bass infused melodies and mammoth drops. Plus a wealth of inventive mash-ups too from artists such as Rita Ora, Rhianna or our very own Zara Larsson, meaning no two performances from R3hab are ever the same. 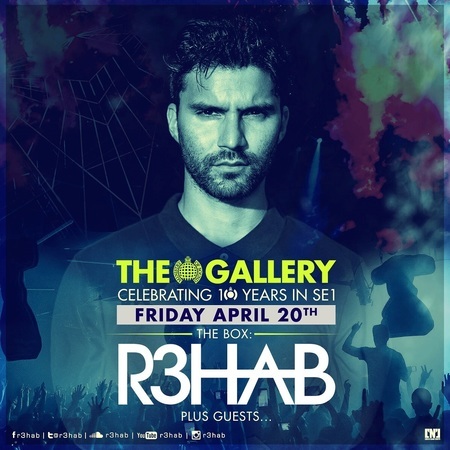 Though what is a common factor, is the element of fun and surprise which means the soundtrack to R3HAB club shows always guarantees a carnival atmosphere. Hence why ever since a Ministry of Sound debut back in 2013, this charismatic showman is arguably one of The Gallery’s most consistent performers. Price: OTD – GBP 26.